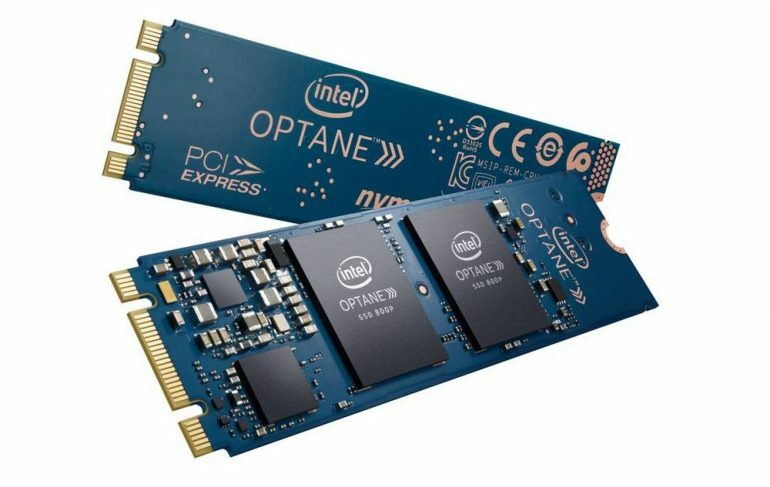 Intel has launched its new Optane SSD 800P and according to the reports, it possesses read and write speeds that are on par, if not a little better than the current PCIe NVMe standard. The Optane SSD 800Pcomes a few years since the introduction of Intel 3D X-Point (pronounced Cross-Point) memory format, and just about a year since Intel introduced its Optane Memory cache drives for the Z270 and Z370 chipset. 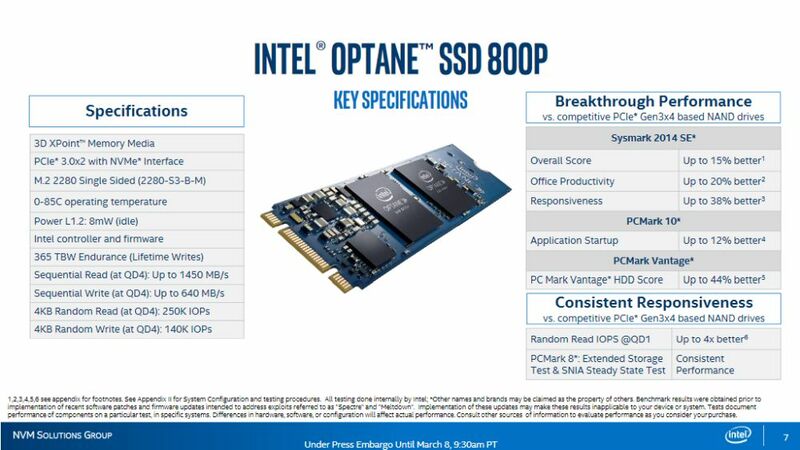 As per the Intel slides, the Optane SSD 800P still uses the M.2 2280 single-sided format, and also has a much higher endurance rating than the conventional NAND-based SSDs (e.g. Samsung, SK Hynix). Further, the Optane SSD 800P won’t be able to utilise a full PCIe 3.0 x4 connection via M.2; at most, the new drive can only utilise a x2 connection. However, this also means that one could possibly (if not theoretically) RAID two Optane SSD 800Ps together, provided that the motherboard in question has more than one M.2 slot. Oddly enough, Intel isn’t releasing its Optane SSD 800P in the standard SSD capacities; the lowest capacity variant only has 58GB of storage, and the highest capacity is little more than double that number at 118GB. And then there’s the price for them. For those among you looking to be early adopters, the 58GB model will set you back US$129 (~RM504), while the 118GB model is priced at US$199 (~RM778). To provide some context; a 250GB Samsung 960 EVO M.2 SSD retails at an SRP of RM649, while an M.2 SATA Klevv Neo N600 SSD with just 120GB sells for just a little less than RM500. And yes, The Samsung 960 EVO M.2 SSD has double the speeds of the Intel Optane SSD 800P. There is, however, a silver lining to this; when SSDs first entered the mainstream, the early models of the storage medium suffered from similar problems: expensive pricetag, and a far more limited storage capacities than what is being offered today. 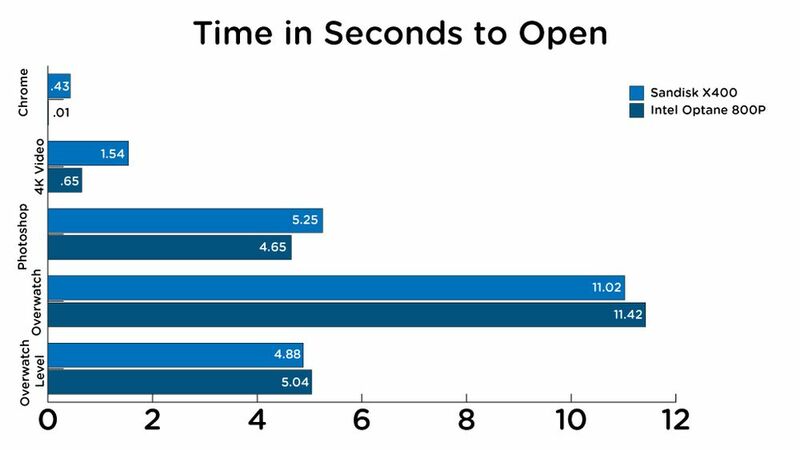 Suffice to say, and given enough time, Intel’s new Optane SSDs will reach the same levels as the conventional SSDs that we enjoy today.